We went to the International party in Kagoshima. We enjoyed question game and hand craft. 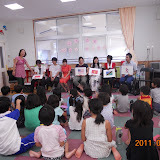 We had a mingling party with kids on 30th August.Students are from China,U.S.A.,Tanzania,Vietnam and Nepal. They introduced their culture and It was very heartwarming party.